After months of volatility, markets relaxed a bit last week. For the first time since October, the S&P 500 went 5 days without a 1% gain or loss. The Cboe Volatility Index, or VIX, also fell to lower than 20 - in December, it spiked above 35. For the week, the S&P 500 added 2.54%, the Dow gained 2.40%, and the NASDAQ increased 3.45%. 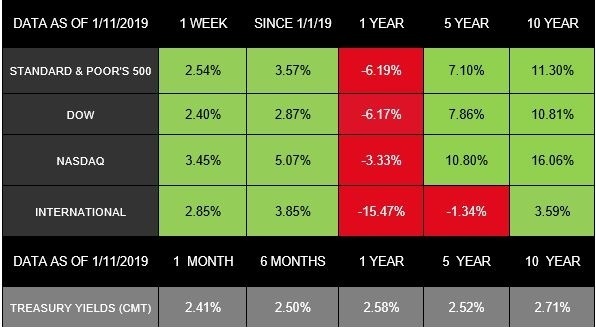 All three indexes are in positive territory for 2019. International stocks in the MSCI EAFE grew as well, with a 2.85% weekly gain. What drove last week's gains? Updates on trade and monetary policy contributed to investor decisions, yet again. The Federal Reserve made dovish comments. Last week, multiple Fed officials gave speeches indicating our central bank would carefully approach its interest rate decisions in 2019. Fed Chairman Jerome Powell described the policies as "flexible" and "patient." A trade resolution seemed more likely. Many investors believe that efforts to resolve trade tension between the U.S. and China made progress last week. On Wednesday, January 9, talks concluded in Beijing after three days of negotiations, and China said the "in-depth" meetings made a resolution possible. The next day, U.S. Treasury Secretary Steve Mnuchin announced that a high-level Chinese policy advisor is coming to D.C. later this month for further talks. Last week's trade and policy headlines seemed to ease some of the risks on investors' minds. However, both challenges and opportunities remain. This week marks the beginning of U.S. corporate earnings season. Analysts have low expectations for companies' 4th-quarter performance, especially after a number of large corporations released warnings about their results. However, analysts still predict that S&P 500 companies experienced 14.5% profit growth. In addition, the generally sour, pessimistic mood surrounding earnings could support equities in two ways: 1) Investors may not react strongly if companies miss projections, and 2) any companies that have surprisingly good results could see stock price jumps. Along with earnings results, investors will be paying close attention to companies' commentary on business in China. Some experts believe Chinese economic growth is slowing, which is already affecting market performance. On Friday, markets stumbled a bit as analysts considered data and commentary on China's economy. These details will remain important to watch - and see how they relate to trade. In addition, while the U.S. federal government shutdown has not yet had a large market impact, if it continues for too long, it could sizably affect the economy. We will continue to monitor these and other financial perspectives as we determine where the markets are - and what may be on the horizon. If you have any questions, we're here to talk and listen.